While single-camera streaming to Facebook Live can be accomplished with ease using Epiphan’s Webcaster X1 for Facebook Live device, there are those who’d like to stream to Facebook Live while also switching between more than one video source or camera. It’s easy to stream a multi-source live production to Facebook Live using Epiphan’s powerful all-in-one live production switcher devices, Pearl and Pearl-2. However—some video content professionals do not require all the features that these versatile appliances offer, or perhaps instead prefer a lower-cost solution that fits within a budget. Luckily, an alternate solution is available in these cases. This page guides you through the process of using popular live streaming platform OBS Studio (free to use) with Epiphan AV.io video grabbers to live stream a affordable multi-source setup to Facebook Live. A Facebook account with administrator access to a Page, Event, or Group. One of Epiphan’s easy-to-use AV.io video grabbers: AV.io 4K, AV.io HD, or AV.io SDI. One or more additional video sources, such as an integrated or USB webcam, (or even a second HD camera attached to another AV.io video grabber). Open Broadcaster Software (OBS) Studio. You’ll first need to connect your AV.io video grabber to capture the video signals from your camera or video source. Repeat this step for any additional AV.io devices you’d like to use in your setup. Connect your HDMI™, SDI, DVI or VGA source to your AV.io capture device using a cable that matches the signal type. (i.e. an HDMI source would connect using an HDMI cable). Connect a USB 3.0 cable from the bottom of the AV.io device to a USB 3.0 port on your capture computer. (A USB 3.0 cable is supplied with every AV.io video grabber). AV.io video grabbers do not require any driver installation or configuration. AV.io devices work with the UVC/UAC drivers already installed on your Windows, Mac, or Linux computer and are therefore sensed as web cams when connected. This How-to article uses OBS Studio 17.0.0 (released December 24th, 2016). Download OBS Studio here: https://obsproject.com/download then install and start the application. We recommend OBS Studio in particular because it is open-source and therefore free to use. Our testing also indicates OBS Studio as an effective and reliable encoding/streaming/recording application. Next you’ll need to add your AV.io device as a video source to your OBS Studio scenes. Repeat this step for any additional AV.io devices used in your live production. With a scene selected in the Scenes section at the bottom of the OBS Studio window, click the + sign in the Sources pane, then Video Capture Device; the Create/Select Source dialog appears. Give your new source a name (like “AV.io HD”) and click OK.
After adding your AV.io video grabber as a source, you’ll next need to create a new scene repeat the process for any additional sources you’d like to use in your live production. What other kinds of sources can I add in OBS Studio? Create a new scene by clicking the + sign in the Scenes pane and rename the scene to your liking. When you’re production is live, you’ll be switching between these scenes containing your sources. 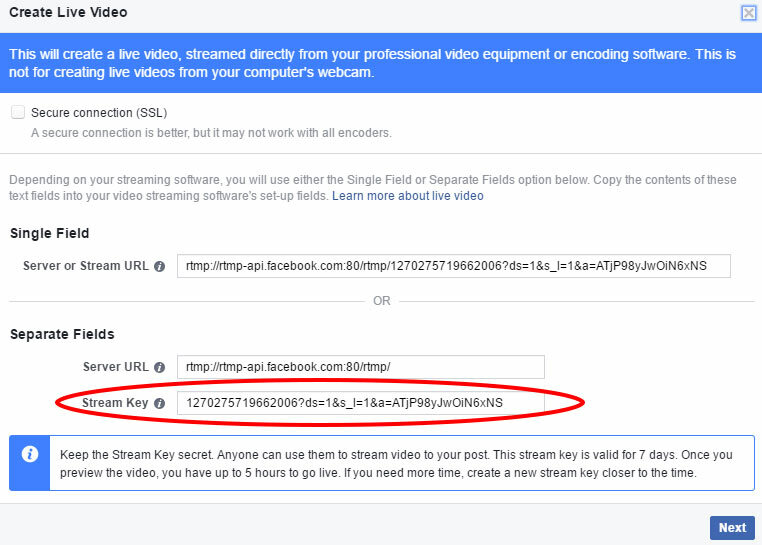 You’ll now need to collect a unique “stream key” from your Facebook page. OBS Studio uses this unique key to communicate with Facebook Live and live stream your production. In a web browser, navigate to your Facebook Page, Event, or Group. At the top of the web page, click Publishing Tools, then Videos, and then click +Live; the live stream configuration window appears. Copy or make note of the Stream key. (The Server URL field can be safely ignored; OBS Studio doesn’t require this particular information.) Leave this page open in your browser, as you’ll need to return in Step 6. 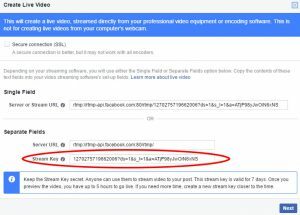 The Stream Key can only be used for a single live stream connection, including preview of your stream in Facebook Live. You need a new Stream Key to resume your stream every time you cancel your broadcast or stream preview. The Facebook Live stream key you just found now needs to be entered into OBS Studio. Click the Settings button in the lower-right corner of the OBS Studio interface to open the Settings window. 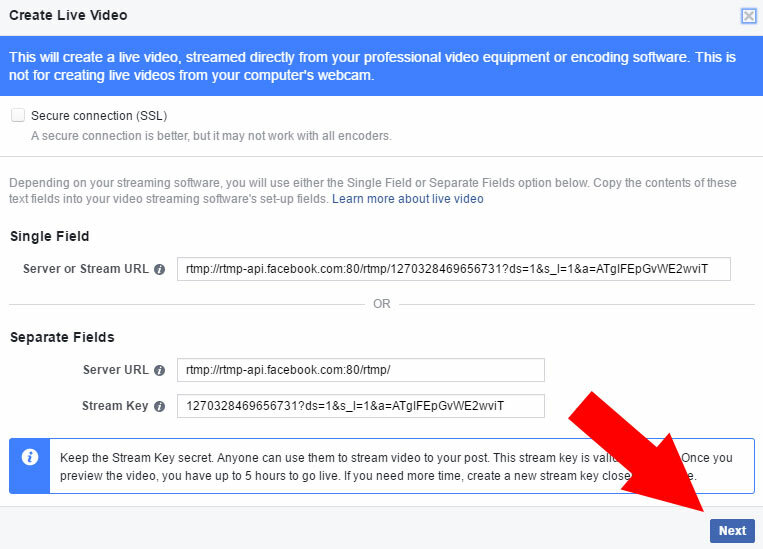 Click Stream, then select Facebook Live from the Service drop-down menu and paste your key into the Stream Key field. 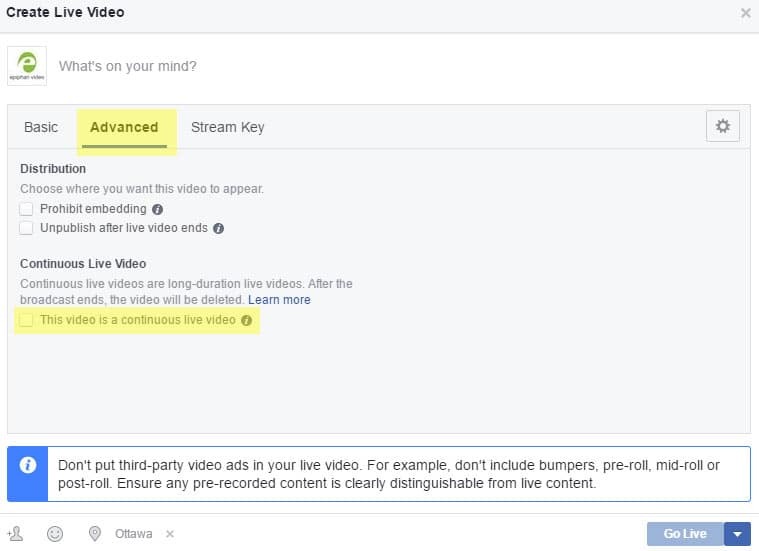 Selecting Facebook Live from the list of streaming services automatically ensures that you do not exceed the max bitrate or key-frame interval limit of Facebook. With your Facebook Live key copied into OBS Studio, you now need to configure some basic encoding settings for your live stream. 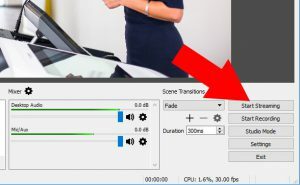 Within the OBS Studio Settings window, click Video, then enter 1280x720 into the Output (Scaled) Resolution field and 30 into the FPS field. Facebook Live currently supports resolutions up to 720p and frame rates up to 30 fps. See Facebook Live video specifications page for additional details. Click Output, and set your desired bitrate in the Video Bitrate field (Facebook Live supports a maximum bitrate of 4000 kbps). If you’re streaming audio, set the Audio Bitrate to 128. Higher bitrate streams yield improved quality at the cost of higher upload bandwidth. Consult the OBS Stream Settings Estimator if you’re unsure of what bitrate to use. At this point, all other values (codec, colorspace, etc) can be left at default. However, you can still choose to configure any additional settings, such as audio, if desired. What are the main defaults I should be aware of? In the OBS Studio main view, click Start Streaming to push the stream to Facebook Live. 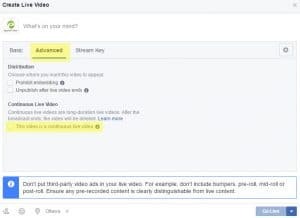 You are not live streaming at this point; you need to preview and confirm the stream via Facebook before the stream is actually published (see Step 9 below). Ensure all pre-production configuration is complete before starting the stream. If you start and stop your stream (including a preview) you will need to create a new live video in Facebook (see Step 1) and copy over the new stream key into OBS Studio. Now that your production is configured and broadcasting to Facebook Live, you need to return to your Facebook page and perform some final verification before the stream is formally published. From your Facebook browser window or tab, click the Next button at the bottom-right corner of the window to open the preview page. Verify that your stream is coming through correctly, and when satisfied, use the fields on this page to add a video title, keywords, and accompanying text to post alongside your live stream. If you receive a “Stream is offline” message, make sure you started streaming from OBS Studio (see Step 8 above). If you still have issues, ensure the stream key was copied correctly. Once you begin a preview of your stream, you have 5 hours to go live before your key becomes invalid. If you need more time, remember to regenerate a new stream key closer to the event time. Simply repeat Step 1 above after the 5 hour limit has passed to re-create your key. If your stream will last for longer than 90 minutes, click the Advanced tab and click the This video is a continuous live video checkbox. Ignore this step if your stream will not last longer than 90 minutes. A continuous live video (i.e. a stream that lasts longer than 90 minutes) is not encoded for video on demand when the stream ends. Also, continuous live stream does not send notifications to followers when published. Congratulations—you’re now streaming a multi-source live production! 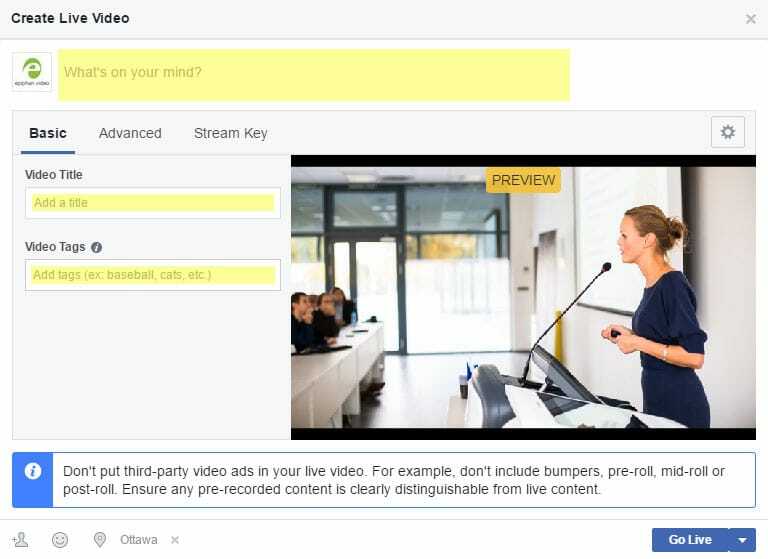 Switch between scenes containing your camera/video source (connected to your AV.io capture device) and any other sources to create a dynamic live event for your Facebook followers. When your live event is complete, simply return to OBS Studio and click Stop Streaming to end the stream. If the live video lasted less than 90 minutes (i.e. 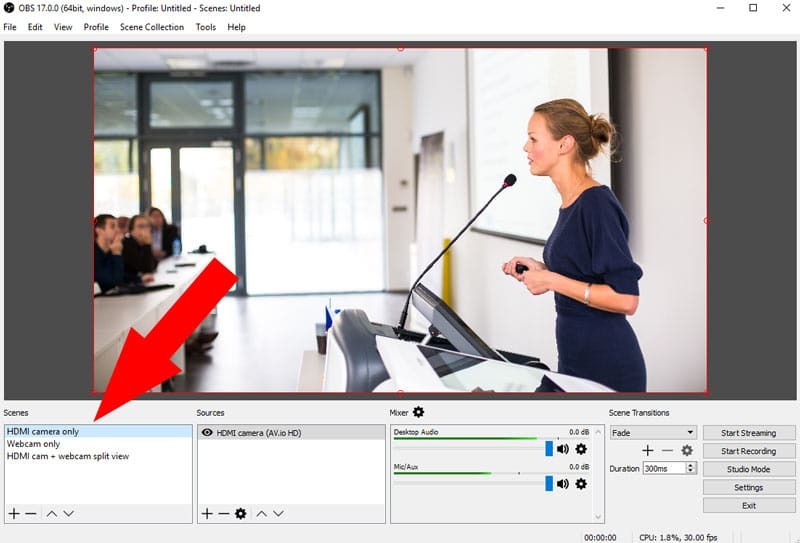 not set as a continuous live video, as in step 3 above), the event will close and the streamed video automatically begins transcoding into an on-demand video and will appear in the Video Library. The video is also saved as a post on your Event, Group or Page which your followers/members can replay at their leisure.